I've always found the tradition of rewarding a champion by making them look like a shrubbery rather curious. Anyhoo, I posted this clip with the hope that Justin, or anybody else for that matter, might be able to help with a translation (of the translation). "Moves are afoot to outlaw professional players in the London League," reported Malcolm Pein on Wednesday in The Daily Telegraph. "The matter may be discussed at the league’s next AGM. Several teams have fielded Grandmasters and International Masters over the years and most recently your correspondent’s team Wood Green, who won the London League 2006-2007 have had as many as five Grandmasters playing in crucial matches." This raises more than one intriguing question. Is anti-professionalism good for a chess scene? Is there an official mechanism for determining who is paid to play in a chess match, and who not? How did Malcolm Pein find out about this story? Who are the mysterious unnamed movers attempting to do this? Is this as surprising to you as to me? - says research by the American Academy of Neurology. Now, I have some personal experience witnessing Alzheimer's at work. My Grandfather suffered from the disease for his final few years. Although perhaps "suffered" isn't the right word, at least for his case. He would frequently pleasantly hallucinate during this period of life, telling us for instance on the phone how he'd just got back from bowling for Norfolk County at cricket, albeit underarm. And he never had to face his own mortality, which is perhaps an existential blessing of sorts, a blessing of innocence. Perhaps. Perhaps not. He never played chess though. Anyway, I don't think anyone knows if Alzheimer's is inherited or not - so I think I just found another reason to continue playing chess for the rest of my life. 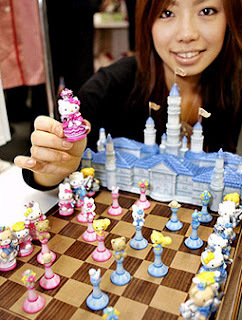 A few assorted bits and pieces that caught my eye from around the chess internet. First off, how does the horsey move again? And also on the subject of rules being rules - or perhaps not - there was this far more serious post over at Boylston Chess Club. The active chess population is ageing and numerically in slow decline. Chess has not been regularly on national television since Channel 4 covered the 1993 Garry Kasparov v Nigel Short world title match and junior chess, which led the English advance in the 1970s, has become a potential disaster area. Thirty years ago it was possible to look at the grading list, spot talents who were far advanced for their age or making quantum strength jumps and invite them to training groups or to the Lloyds Bank Masters. Many became GMs or IMs. Now the GMs Gawain Jones, 19, and David Howell, 16, may be the last of the line. Looking at the current junior grades it is hard to see any under-14 who is better than a long shot for IM. On this subject the ECF still seems in denial. First and foremost I consider myself to be a chess player. However the economic situation was so dire as recently as 2005 that I only played one tournament (Corus), despite the fact I had contacted numerous organisers pleading (unsuccessfully) for invitations. For reasons I do not fully understand, I now very much in demand and have a very full schedule of events up until Spring 2008. Well, I suppose at least one English chess player aside from Michael Adams is still doing comfortably well then. And as for the mysterious recent spate of invitations, any one want to hazard a guess in the comments? ... and an unusual opponent. What the hell did I do for entertainment before I got broadband? 1. Build a big centre. 2. Exchange the dark squared bishops. 3. Swap off the major pieces. 4. 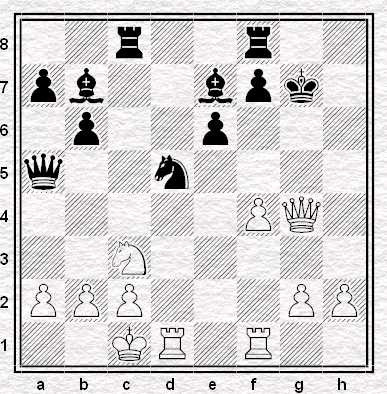 Win the Knight v Bad Bishop ending. It's all strategy. No need to bother with any of that tiresome business of calculating tactical lines. The Closet Grandmaster is worried he might suffer from Narcissistic Blog Disorder, "in which the individual consistently denigrates not only the opinions of others, but the very fact that others have opinions... Simultaneously, the individual assumes that people do care about what he or she has to say, in spite of the individual's only political or activist experience being watching the movie Dave, twice." The desire to participate in an internet fad is considered by psychologists to be a natural, if sometimes unfortunate, aspect of human nature. Some individuals, however, appear to have a clinical inability to recognize the fleeting nature of fads, and continue to attempt to participate after everyone else is sick to death of the whole thing. 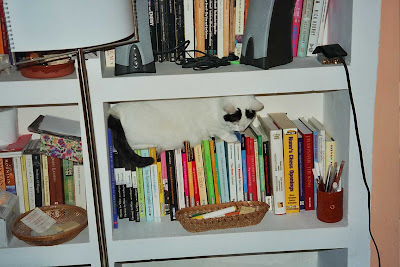 The current diagnostic criterion is "the use of the phrase 'all your base are belong to us' in any non-ironic context" but in 2010 it is expected to be expanded to include any suggestion that a photo depicts a cat interacting with an invisible object. Do I need a Doctor? What's your diagnosis? There have been a couple of attempts to include articles in Wikipedia on chess blogs or the Knights Errant and in each case the Wikipedia community (I affectionately refer to them as “Pinheads”) has decided to remove them. Clint Ballard ran into the same problem when he tried to post an article on his controversial BAP chess tournament scoring system. This, I have to say, is not the first time I've heard complaints about a clique dominating wikipedia's chess content. Enough nitpicking. After all, it could be worse, so perhaps we ought be grateful. 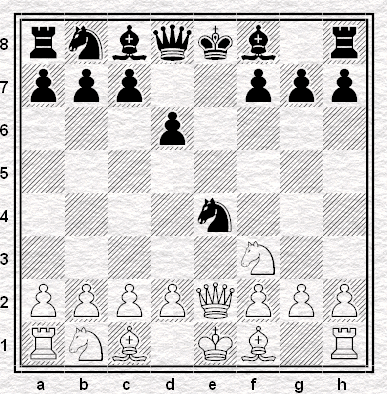 How are the wikipedia chess pages for you? Regular visitors to our blog may recall about a month ago I wrote about a chess game that appeared in an episode of Blake's 7. Subsequently I managed to track down a video clip on YouTube so you can watch it for yourself. The beginning of the programme sees Avon and Vila deciding not to teleport down to Freedom City with Blake and the others. They claim to be playing chess but since they’re seen studying the rather unlikely position at the head of this post, what they’re actually up to is anybody’s guess. Later on, the pair decided to pop down after all with a plan to bankrupt the casino by cheating at Roulette then get back to the Liberator before anybody notices they’re missing. Sadly the plan goes awry and Vila gets drunk and is conned into taking on chess playing genius The Klute. If he wins or draws he doubles their winnings. If he loses, though, he gets fried. Now The Klute may look like a reject munchkin from a Bollywood remake of The Wizard of Oz but he really is a bit tasty at the chess board. There is some good news for Vila however. He has Orac, the universe’s most powerful, and indeed supercilious, computer whispering moves in his ear. Reconstructing the game was more straightforward than Klute – Frels. Incidentally this is a drawing device I happen to know about because I once used it in a similar position during an off-hand game against Justin – the only time I’ve ever played him and not lost. it didn’t really make sense. 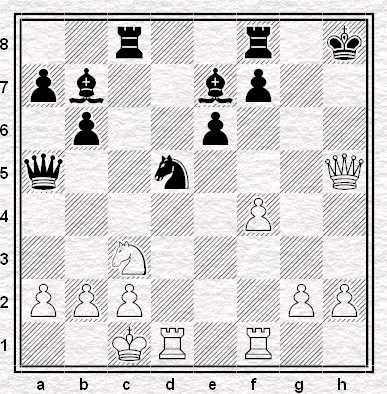 Amongst other things, surely at move 11 The Klute would have preferred to play Knight takes Bishop on d4 rather than exchange Knights on e5. … and the case, as Inspector Clouseau likes to say, is solv-ed. Occasionally you find yourself reading some unexceptional passage, so apparently uncontroversial that it's only when you've gone past it that you think you saw something awry. Your eye drags you back up the page, like a kid pulling their mother's arm, and you look again and say to yourself - hang on, that's got to be nonsense, hasn't it? Maroczy was forced to live in exile for some seven years. 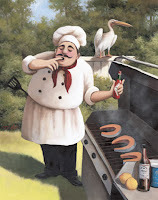 Somehow he had become compromised during the Communist revolution that shook Hungary in 1919. To imagine Maroczy as a revolutionary, and a Communist one at that, is completely ridiculous. He would never knowingly break the law or abet any kind of law-breaking. The only explanation for his difficult situation is that he must have fallen into some sort of political trap, perhaps by signing a petition the portent of which he failed to appreciate. He was naive enough to have done that. Some time after he left Hungary the Communist authorities realized their mistake and called him home, but since he had in the meantime resumed his chess career, they had to wait. Maroczy's second chess career (1920-1936) was to last about as long as his first (1895-1911). So Kmoch has Maroczy fleeing the country because he was suspected of being a Communist - and being pursued for that by the "Communist authorities"! Not only that, but they "call him home" during a chess career that starts in 1920: despite the fact that their government had been overthrown by a Romanian invasion in - August 1919. So what was Kmoch babbling about and - since the article first appeared 56 years ago - has anybody, before now, pointed out that this appears to be nonsense? Your chance to beat the world's most famous Grob-aficionado - the ever-grinning International Master Michael Basman - is coming up sooner than you might imagine. He's giving a simultaneous display next week over at West London Chess Club, who've emailed me to say spaces are still left. The event will be held on Wednesday 20th June at 7.15pm in Chiswick Town Hall, with an entry fee of £12 for non-members such as ourselves. Those willing to take their chances against Basman's brand of crazy chess should email Mark Lyell as soon as possible to enter. And should you do so, good luck! If this didn't convince more girls to take up our delightful game, then maybe this will instead? 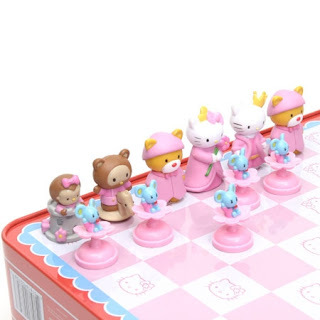 At first I thought it was the worst chess set I'd ever seen, but it's kind of growing on me, and now I'm starting to wonder if it should replace the standard Staunton stuff. Recently a correspondence tournament in which I took part finished in strange circumstances: the Tournament Secretary announced that one of the competitors had died. This was unusual enough: but it was more than that, unreal more than unusual, because almost as soon as I had received the information, I began to feel that there was something wrong, something missing, something about it that was hard to believe. My opponent, Mark Mills, was a professional pool player, or so he said. Pool is not a sport much covered in the UK press, even less so than chess: the death of a professional wouldn't make much news. But it would surely be reported somewhere: in websites devoted to the game, or in the local papers. I searched the Web for references to Mark Mills combined with words like dead or died or death: nothing of relevance could be found. No pool site that I found - though I did not find many - had anything to report. Mark Mills is a British professional pool player. Mark Mills is a professional bullshitter. It has been reported to his email chess opponents that Mark Mills has died. This, I thought, might clarify the position: since his entry was the subject of contention, any future changes might tell me precisely what was going on. Why was I bothered? For one thing, pure curiosity, the same reason that the reader has continued to read this far. But for another, a feeling that there was a question of ethics here, that if somebody had dropped out of a tournament claiming to be dead, then that was some distance out of order. A generous description might be "childish": at best, the most pitiful way to evade resigning that I'd ever come across. Less generously, it made fun, for no reason, out of friendly strangers: it invited them to express condolence when nothing had actually happened. I was annoyed: I was sure that Mark Mills wasn't dead and equally sure that we should not have been told otherwise. I emailed a few addresses that I found on the pool websites, asking if they had any information. Only one person replied, saying that she did not know anything but that she would ask around: and I waited to see if she could come up with anything. While waiting, I had another look around pool websites and this time I noticed something I should have noticed before: that on one site, Pro9.co.uk, there was a bulletin board and that one of the posters on that bulletin board was Mark Mills. And that he was posting currently, more than three weeks after I had been informed of his death. Is the Mark Mills who posts on this site any relation to the professional pool player Mark Mills whose death was announced to his correspondence chess opponents last month? That is strange, because the message about Mark Mills dead came from his wife, Tracey Mills, where she stated that Mark Mills passed away on the 9th of May. So why? I mean why would anybody do this? Jesus, I know some people have difficulty resigning but it's not so hard in an email game where you don't even have to look at your opponent, let alone shake their hand. What's the point? Was he trying to disappear and start his life all over again like Reggie Perrin? I'd never come across anything like it in my life. Was he on the run from his creditors and the law? If so, why keep on posting on a website under his own name? Presumably he just thought it was really funny at the time? You will find that was my wife who did that when we split up she told a few people the same thing, i could not don't care though she is the one who screwed some else. So it wasn't him, it wasn't his idea, he didn't find it funny and - except insofar as bathos is funny - it wasn't funny at all. Or funny, but only in the grimmest kind of way. On Saturday, Surrey beat Greater Manchester 9½ to 6½ to reach the final of the County Chess Championships. Surrey went 2-0 up after Manchester had a pair of players turn up an hour and a half late and default, and then kept the lead all the way through. Streatham & Brixton Chess Club member Robin Haldane played for Surrey ... but alas lost his game on time. The Open team will now face Lancashire in the final on July 7th, same day that the Under 175 team, who qualified by beating Yorkshire, face Middlesex in their final. "Topalov to open chess cafe in Sofia," reported Chess Lodge last month. "Special guest Veselin Topalov will have the honor of ordering first drink." I wonder what he chose? I'm guessing it wasn't a White Russian. 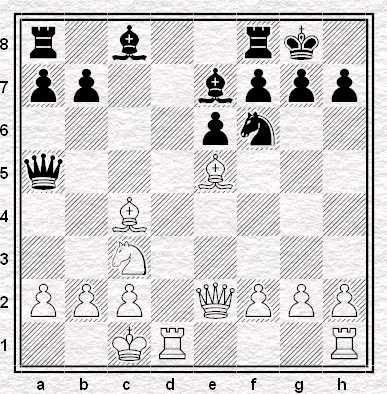 In the white corner sits a Grandmaster. In each game of the match he'll have twice as much time on his clock as his opponent to begin with, and with each move he will receive three times the increment his opponent will get - and, he also knows rather a lot of opening theory. As opposed to his opponent in the black corner, who along with the time handicaps, and playing black in each game of the match, only knows theory up until move three. But: who goes by the feared name of Rybka. And there's one extra thing. These two played a match before. 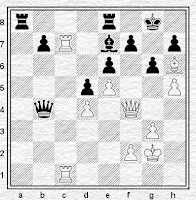 Then, Rybka played at pawn odds in each game (albeit with white in each game) and, won. By 5½ to 2½. So who is your money on? 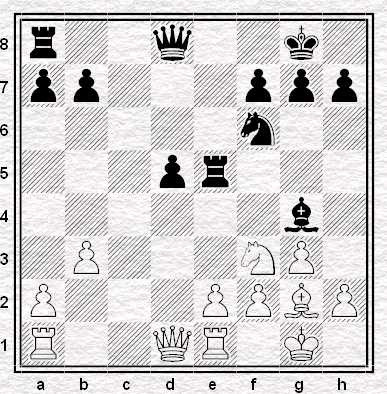 Readers with high boredom thresholds may recall this somewhat theological discussion (continued in the comments) which touched on many matters of small importance, including the question as to whether a chess game could be declared a win for one party or the other after the two players had actually agreed a draw. Apparently, it can, since I have just been the beneficiary of precisely such a decision. I have been playing in the preliminary round of the IECG Cup 2006, a correspondence tournament. I've done well: despite being ranked only third in the group I've finished joint first with one other player and qualified for the next round. I beat the second-ranked player in the game mentioned here: I drew with the top-ranked player after a long defence on the black side of an Exchange Slav. 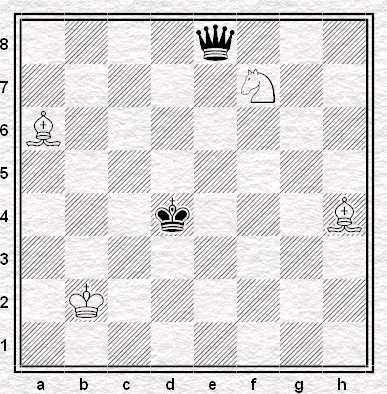 Correspondence chess is so exciting. The lower-ranked players either dropped out - there were several withdrawals - or lost to me, with one exception. Or one apparent exception. One of my opponents was Mark Mills, a professional pool player, ranked several hundred points below me, a fact which possibly caused me to underestimate him. After mishandling the opening I found myself in a position with no possibilities for active play save those which opened the position for my opponent's benefit. 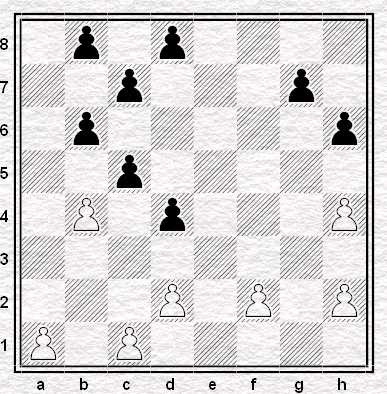 So I was contemplating another arduous defence, but, given that Mills had no obvious threats - simply much better placed pieces - and there was that huge rating gap, I thought I'd try my luck with a draw offer and see if he either jumped at the chance to take a half-point off an apaprently better player, or, maybe, might even fail to appreciate the depth of his advantage. Either or both applied, as he accepted the draw, to my relief and we wished each other the best of luck in the future. Subsequently I secured my other draw, completed my games and assured myself of a place in the next round. 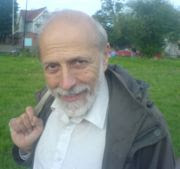 Then, a couple of weeks ago, I received a message from the tournament secretary saying that Mark Mills had sadly died. As his games were the only ones outstanding, this brought the group to a close and we were sent the tournament table. Much to my surprise it recorded only one draw on my part - since all of Mills' opponents had been awarded a win in their individual games. Including me, despite the fact that I had agreed a draw with him (and considered myself fortunate to get it) some months before. Can this be right? I know that the practice in OTB all-play-all tournaments is to award wins to the opponents of a player who has withdrawn - unless they withdraw before halfway, in which case (as with, for instance, Bobby Fischer at Sousse in 1967) their record is expunged. In neither of these instances, though, does this entail awarding wins to players who have already drawn (or even lost). It's an odd business all round, to tell the truth, for reasons I may go into in the comments. Actually it reminds me that when I was at university, it was popularly supposed to be the case that if one died before one's Finals, one would be awarded a posthumous First. Here, though, it's more like the other way round - everybody else is awarded it. There is, I believe (though I have forgotten the title) a Hollywood film based on the similar - and more relevant - story that if one's room-mate dies before the course is completed, one is awarded the top grade in compensation. Anyway, I've agreed a draw and yet been awarded a win in the tournament table. I've never seen that done before. The remarkable results of the Ilford Chess Congress, held over the Bank Holiday weekend, are beginning to be published. And whilst my own performance was rather good for me - that was nothing compared to the achievements of a very talented and highly promising trio of London chess juniors. 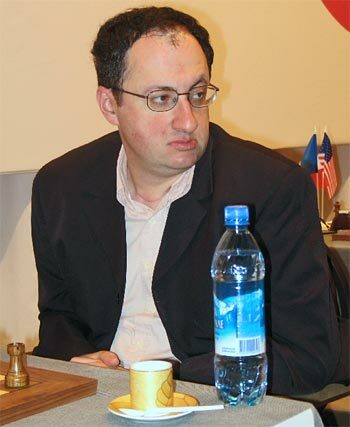 One of whom even achieved the truly extraordinary score of 2½/3 from his games versus three International Masters - and he was pushing for the win in the draw most of the game, too. Subin Sen (aged 14) beat IM Colin Crouch in round 1, drew with IM Philip Morris in round 3 and beat IM Augustin Madan in round 4. Akash Jain (aged 13) [finished] undefeated on 4 points ... and must be be the amongst the youngest (if not the the very youngest) [player] to qualify for the British Championship. Yang-Fan Zhou (aged 13) on 3½ points was also undefeated until he met IM Augustin Madan in the last round. This was a most upsetting and unfortunate loss for Yang-Fan who was always slightly better during the game. Towards the end of the quick play finish, with both players extremely sort of time, Yang-Fan had just a knight and a rook’s pawn left whilst his IM opponent had just a bare knight. When Yang-Fan’s flag fell he perhaps naturally assumed that he would be awarded the half point that would have meant a share of 2nd place with 4 points. However his opponent insisted on claiming a win on the basis that he could still achieve mate with the bare knight however unlikely that might be. This apparently is the rule as we confirmed by referring to an appropriate website on the internet which was available to us at the venue. Our controller then felt that he had no option but to award the win. What can you say . . . ? Despite starting with only 14 players for a 16 board match and then soon facing a ½–5½ deficit, Surrey County eventually recorded a stunning 9½–6½ victory on Sunday over Yorkshire, in the Under 175 section of the National Stage of the County Chess Championships. The team thus qualify for the final, where they will face either Essex or Middlesex. Two players from Streatham & Brixton Chess Club - Robin Haldane and Angus French - played, and both played their part too. 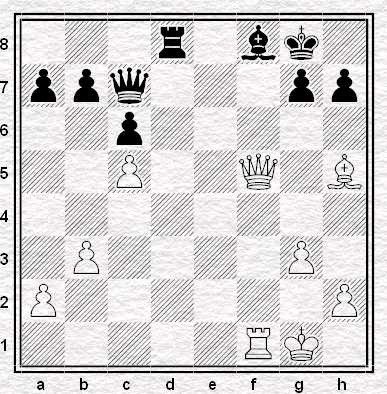 Robin slowly ground his opponent down to take the full point, whilst Angus finished off a tense, manoeuvring middlegame against Trevor Braithwaite with a particularly suave pair of sacrifices (see diagram, white to play and win.) Perhaps the location in Leicestershire – a mere 275-mile round trip by car! - put other players off, but this seems rather a shame if so. The venue Syston and District Social Club has been nominated for CAMRA Club of the Year 2007 - whilst its hire and the excellent buffet from hosts Cyril and Julie Johnson cost a mere £3 per player. So good luck in the final. And also in Surrey County chess news, next Saturday the Open team play Greater Manchester in their semi-final: best of luck to them too. This is quite a famous position but I've been keen to post it for some time now. To my eyes it's one of the most appealing finishes to a game of all time ... and if that weren't enough, it also gives me the chance to use Zwischenzug (twice now), one of my favourite words.